how to increase your vitamin b complex intake during pregnancy. B-complex Vitamins are a group of water soluble vitamins which includes all the 8 vitamins –a list of which is givenbelow in a table. All these vitamins are necessary for you to lead a healthy life style. Every nutrient plays some role in keeping us healthy. Some work towards general well-being while others help specific body parts like eyes, skin, hair, muscles, etc. You can improve your B-complex vitamin levels by cleaning up your diet and adding some healthy ingredients to it. Stay away from processed foods, and go for whole grains like Wheat, Jowar, Bajra, Ragi (Nachni), oats, brown rice, unpolished white rice, rice bran and wheat germ. Date and Banana Shake is a great way to start your day, especially during your first trimester when you may have lost your appetite as a result of morning sickness. The natural sweetness of the dates and bananas is enriched by the addition of milk and it provides for all the required calcium, protein and iron to supplement your diet. Nourishing Lettuce Soup is an unusual yet delicious combination of lettuce and onions is sure to become a firm favourite and help restore your B-complex vitamin levels as well. Though just pepped up with salt and pepper, it's sure to tingle your taste buds. Spinach and Mint Juice is a good source of Riboflavin and Folic Acid. The lemon in this dark green juice helps to retain the colour and enhance the absorption of iron in it while the digestive oils in mint aid digestion, as indigestion is common during pregnancy this drink is a perfect option. Panch Dhan Khichdi is an extremely appetising mixture of rice with five kinds of lentils that provide the expectant mother with essential b-complex vitamins B1, B3 and B9. Loaded with ample amount of fibre, this khichdi is also quite filling. Serve this with fresh curds to pack it with high quality proteins. The unusual mix of urad dal and spinach in Urad Dal with Spinach Subzi carries a healthy dose of B-complex vitamins such as thiamine, riboflavin and folic acid. Pair it up with whoile wheat flour rotis or phulkas to add to its nutrient quotient. Spicy Sprouts Pulao gives you a good dose of thiamine which is necessary for various functions in our body like carbohydrate metabolism, production of RBC’s amd protection of nerves. 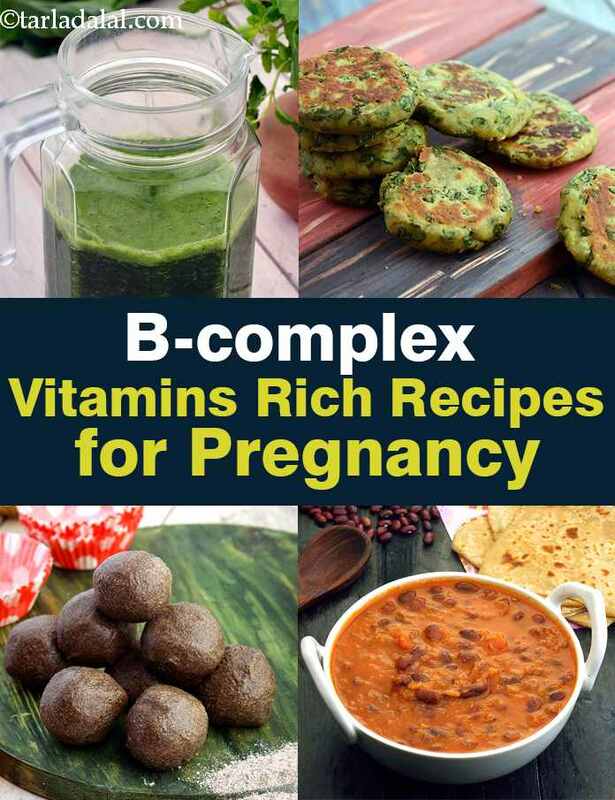 Enjoy all our b-complex vitamins rich recipes for pregnancy. Explore more varieties in our pregnancy section everyday.